A new mural has brightened a downtown State College building and alley, adding to the borough's small but eclectic collection of public art. 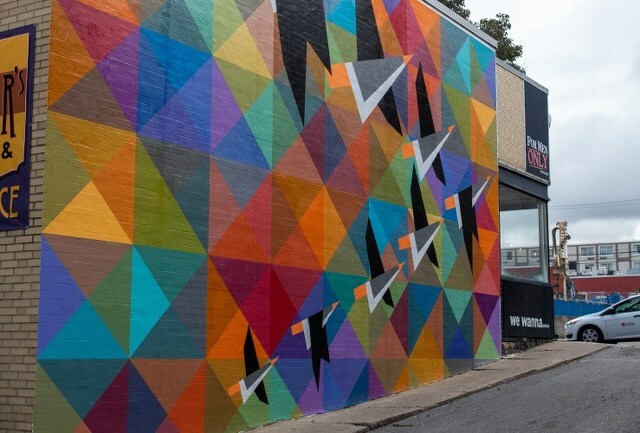 Artist William Snyder III, of Port Matilda, and a team of community volunteers spent the past two weekends laying out and painting the mural installed on Humes Alley, covering the side wall of For Men Only salon and leading to the rear entrance of Webster's Bookstore Cafe. The mural is called "Wild Geese" and is inspired by the poem of the same name by Pulitzer Prize winner Mary Oliver. 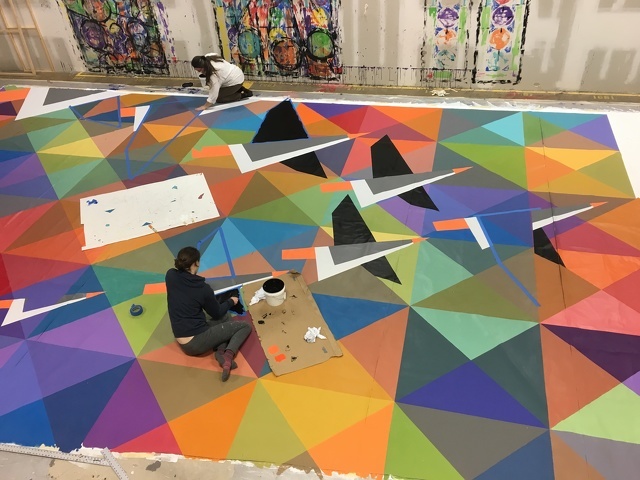 “We used eight rolls of blue tape to mask each triangle, and I mixed the 95-plus colors on the fly, trying to keep up with the volunteers filling in the design,” Snyder said. Volunteers paint the mural "Wild Geese" prior to its installation on Humes Alley in State College. Photo provided. Trailhead, a new local organization that provides funds for ideas to make the Centre Region a better place, awarded a $1,000 grant for the mural in September. Sharon Lucas, Gail Simpson, Angie and Drew Keller, Laura Snyder, Eric Robinson Jr., Robyn Passante, Tim Parker, June Ramsey, and Spud and Katie Marshall made up the paint team, and Garen Jenco was the installation assistant. Snyder, a part-time art instructor at Penn State who specializes in unique sculptures, paintings and installations for public display, also recently painted over his "graffiti-style" necktie design behind the State Theatre with a blue that will be the base for his new mural, "Be." 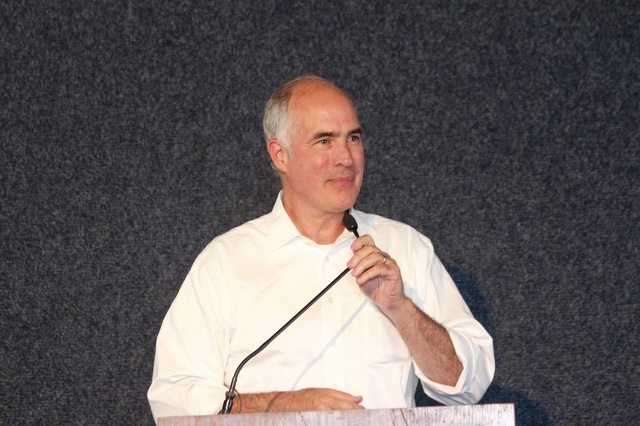 U.S. Sen. Bob Casey will make a campaign stop on Wednesday at Penn State, joining with local Democratic candidates for a get-out-the-vote rally. Casey will be joined by congressional candidate Marc Friedenberg, state Senate candidate Ezra Nanes and other local Democratic leaders at 11 a.m. in Room 129 of the HUB-Robeson Center. Registration to attend can be found here.